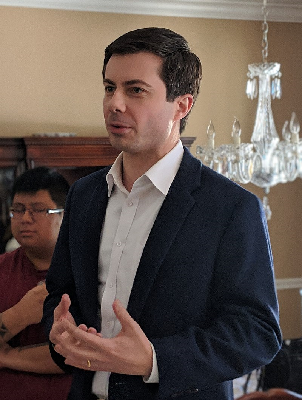 Pete Buttigieg is an unlikely Democratic presidential candidates amidst the crowd – mayor of a midsize city, 37 years old and openly gay. But he’s garnering praise for his stance on the Green Deal and his support for his Muslim residents in the wake of Christchurch. Born 19 January 1982 in Indiana to two academic parents, he made his mark through school and college, was a naval reservist, then became the youngest mayor of a mid-size city for two terms. His career has been upwards and onwards since his teens. He’s a last degree Capricorn Sun in an ultra-determined square to Saturn Pluto in Libra; his Sun is also conjunct Venus in Aquarius square Jupiter in Scorpio so he’s charming, tolerant and lucky as well. 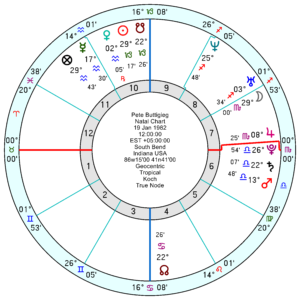 His high hopes will get tempered from this May onwards with tr Neptune square his Sun/Jupiter midpoint, running into 2020. Over the election itself tr Saturn is blocking his enthusiasm square his Mars/Jupiter and the tr Jupiter Pluto is square his Saturn, which is probably not great either, despite Jupiter’s presence. However he does have tr Uranus opposition his Jupiter in November 2020 which suggests good news of some variety. He’ll be around for years and years so this first throw of the dice may just earn him name recognition outside of his own circle. And there’ll be everything to play for in future years. 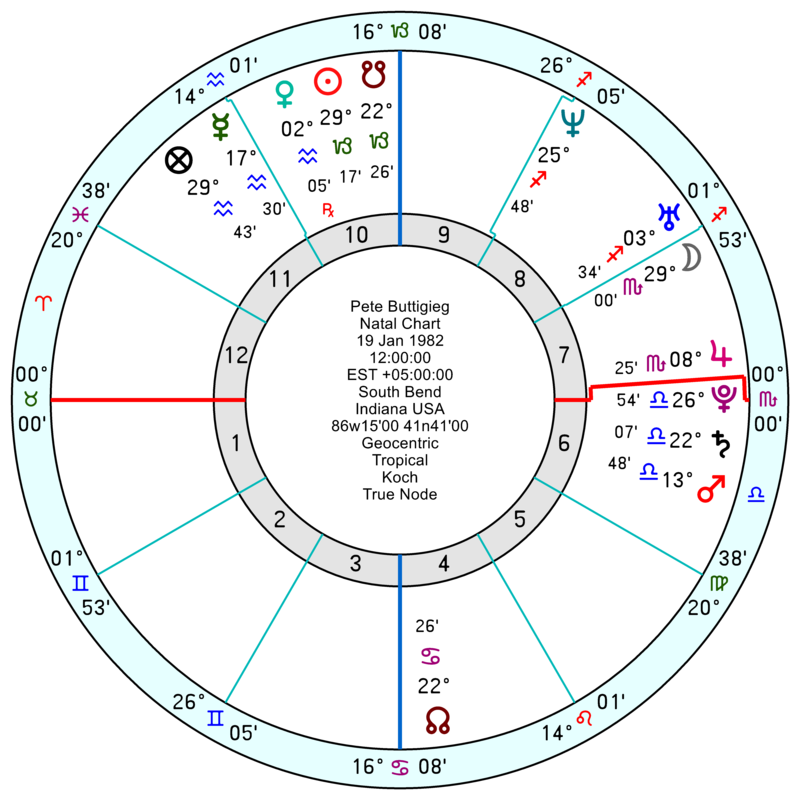 Buttigieg’s transits in 2024 are very powerful – Pluto conjunct his Sun during the three months leading up to the election, plus a Pluto square pointing to a major transitional event and a call to leadership. On the other hand, a Saturn transit opposite his Moon-Uranus conjunction in 2023 could be uncomfortable at both a personal and political level. But Saturn opposite Uranus at this time could also push him to a new realisation of what he wants to achieve and how he communicates. Look at those three planets in the 6th house. Nothing opposes them, and they are in balanced Libra. He could be the one to reform health care. Puts restrictions (Saturn) on prescription drug prices and hospital profiteering. I don’t think we have a birth time – the chart is set for noon, so houses are unknown. Unfortunately! I really like what he has to say. And he is calm, reasoned and thoughtful. Would love to see him in the Cabinet. I think he didn’t see this coming himself! But I’d be surprised if there wasn’t a Cabinet position waiting for him in. And, I have to say, a VP debate between Pence and Buttigieg would be one to watch. Governorship or a Senate Seat in the future, since none are open in Indiana in 2020. Thanks, Marjorie. Someone to watch!